OK, so I've been missing for a long time - sorry about that. My humor has not been the best, even feeling sorry for myself (shame on me! ), and I just haven't felt like dreaming up something to write. But starting today, as a New Year's resolution, I'm going to try again to make regular entries, and its partly because this story tickled my imagination with it's bubbles! 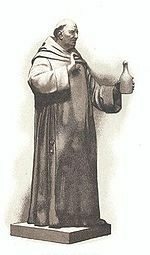 According to legend, a French monk named Dom Pérignon realized that a cork could seal in the fizz and flavor of Champagne after he saw Spanish travelers using tree bark to plug their water gourds. 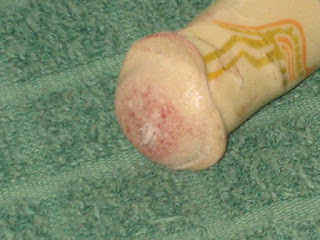 But George Taber, author of "To Cork or Not to Cork," and other historians dispute this story. Taber cites evidence of Champagne corks on the Duke of Bedford's household inventory list from 1665 - several years before Dom Pérignon took charge of the vineyards at the abbey of Hautvillers. Still, Pérignon and his name remain indelibly associated with Champagne. Historians do know a good deal about how corks were used in the 18th century, in part because King Louis XV issued an edict governing Champagne bottling. Back then, workers wedged corks in by hand, yoking them with three pieces of twine to keep them in place, according to Becky Sue Epstein, author of "Champagne: A Global History." Even so, Epstein says, these corks could erupt without warning, giving Champagne a risqué reputation and the nickname "devil's wine." A hundred years later, workers took to wearing wire-and-gauze masks when they handled the bottles to protect against the projectiles. "I know one cellar in which there are three men who have each lost an eye," wrote Thomas George Shaw, a 19th century wine trader. 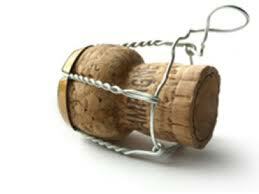 Today, many Champagne stoppers are mashed together out of cork bits, glue and food-grade silicone. They start out fat as marshmallows before they're compressed in the jaws of a machine, driven into the bottle neck and held down with a wire hood called a muselet. It's this process that gives them their ability to cling and their distinctive mushroom shape. "If the bottle opens with a loud pop, that means it's not cold enough," Epstein says. When Champagne has been chilled to the perfect drinking temperature - about 50 degrees - you can "ease the cork out of the bottle so it emerges with a gentle sigh." also, there is "off the top"
Harry Constantinescu is a master in the art of sabrage (opening Champagne bottles with a sword)!! How did this tradition begin?? One of Napoleon's officers couldn't open his Champagne and manage his horse at the same time, so he pulled his sword and beheaded the bottle. 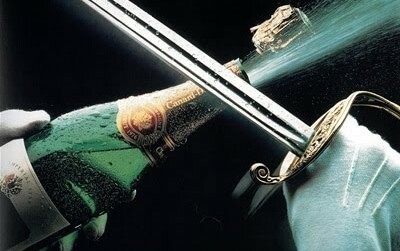 His colleagues began sabering Champagne before battles. And are there sabers made especially for this ritual?? Yes, they start around $300 and to into the thousands. So they're made of gold?? Mine is 24-karat gold. I saber the bottle with the wire cage on it, and so my sword is modified to slice through metal and glass at the same time. How many bottles can you behead in a minute?? Well, at one event, I did 24 bottles. But this guy from Spain did 32, so he got the world record.